Poikiloderma is a condition that causes your skin to become discolored and break down. Doctors believe poikiloderma is a group of symptoms and not an actual disease. The condition is common and chronic, but it’s not life-threatening. This condition can run in your family and be inherited, which means you already have it when you’re born, or you can acquire it after you’re born. It’s associated with several rare inherited diseases and some acquired conditions such as lupus. 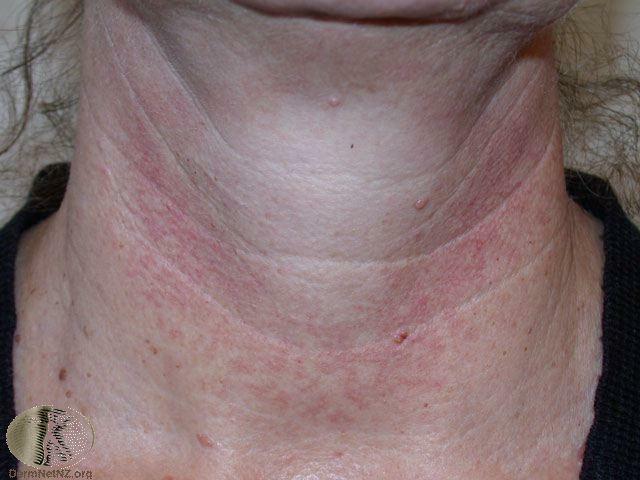 The most common acquired condition is called poikiloderma of Civatte, which is also known as sun aging. What are the symptoms of poikiloderma? You may feel minor burning and itching in the affected areas, but most people with poikiloderma don’t have these symptoms. Your skin changes will gradually increase over time. What causes poikiloderma to develop? You’re more likely to get it if you have fair skin. Skin that tends to be shaded from the sun, such as your neck under your chin, is not affected when the sun-exposed skin around it is. Protecting affected skin from the sun will slow the progression of your skin changes and may even improve it. You’re are more likely to get poikiloderma if it runs in your family or if you get one of the acquired diseases that are associated with it. Make an appointment with your doctor when you notice any concerning skin changes. Your doctor can examine your skin and rule out any serious conditions. If you have poikiloderma of Civatte, your doctor can usually diagnose it just by asking you questions and examining you. If your poikiloderma is due to another inherited or acquired condition, your doctor will probably order blood tests, X-rays, or other tests based on your other symptoms. Poikiloderma can’t be completely cured, but your skin changes may improve and the progression of your condition may slow down with treatment. Treating the underlying cause of poikiloderma is important and should be done first. Then your skin can be treated to try to improve the discoloration and make it less noticeable. Pulse dye lasers and intense pulse light therapy are expensive, but they’re the main treatments currently used to improve the telangiectasia and discoloration of your skin. However, the discoloration can’t be completely fixed, and the treatments make your skin look worse before it looks better. According to the Australasian College of Dermatologists, medications that skin doctors use to bleach or lighten skin can improve the brown discoloration of your skin. After that treatment, lasers can improve the redness. Light therapy can improve both brown and red discoloration. What is the outlook for poikiloderma? While it can be irritating or bothersome, poikiloderma isn’t dangerous or life-threatening. It isn’t curable, but you can minimize your skin discoloration with treatment and prevent further damage by protecting your skin from the sun.